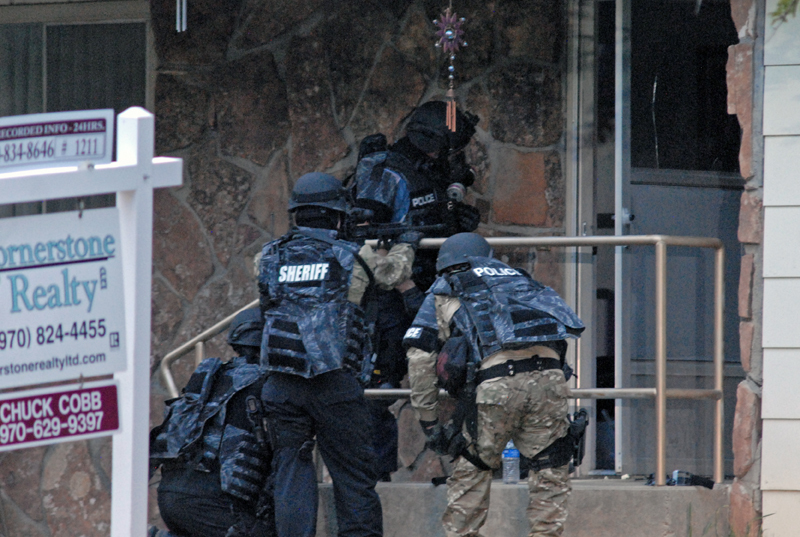 Members of the joint Craig Police Department and Moffat County Sheriff's Office Special Response Team prepare Monday to enter the home of Craig resident Geoffrey Ward Mansfield,39, suspected of being involved in a domestic violence incident. Mansfield barricaded himself in his home at the corner of Rose and 8th Streets, and was taken into custody after a two-hour long standoff with law enforcement officers. A Craig man is in custody after a standoff Monday night with law enforcement officers from the Craig Police Department and Moffat County Sheriff’s Office that lasted more than two hours. Geoffrey Ward Mansfield, 39, of Craig, was booked into Moffat County Jail Monday on suspicion of menacing assault against a family member with a weapon, a felony; and domestic violence, obstructing a peace officer, criminal mischief and refusal to leave premises upon request of a peace officer, all misdemeanors. The incident stemmed from a Monday domestic abuse report allegedly involving a knife, Craig Police Chief Walt Vanatta said. The initial call came in at about 5:30 p.m. Monday. The Special Response Team, Craig Fire/Rescue firefighters and two ambulance crews from The Memorial Hospital in Craig also responded to the scene. The response team is comprised of specially trained officers from the Craig Police Department and the Moffat County Sheriff’s Office. When officers arrived they were able to remove the alleged victim from the home at the corner of Rose and Eighth streets. However Mansfield barricaded himself inside, first in the garage, Vanatta said. Law enforcement officers used a variety of non-lethal tactics in an effort to apprehend the man, Vanatta said. The standoff began with negotiations before law enforcement officers deployed tear gas into the garage. Mansfield then moved throughout the house and was “systematically gassed from room to room,” Vanatta said. Mansfield eventually found himself cornered in a bathroom. Officers moved in and apprehended him with help from a stun gun. He was not armed when taken into custody, Vanatta said. Mansfield was taken to TMH for decontamination and examination immediately following the incident. He was accompanied by Craig police officers and booked into Moffat County Jail just before Midnight, Vanatta said. The incident remains under investigation by the Craig Police Department. Craig Daily Press reporters Nate Waggenspack and Darian Warden contributed to this report.